Photographer Lewis W. Hine (1874-1940) was born in Oshkosh, Wisconsin. He studied sociology at Chicago and New York universities, becoming a teacher, then took up photography as a means of expressing his social concerns. His first photo essay featured Ellis Island immigrants. In 1908, Hine left his teaching position for a full-time job as an investigative photographer for the National Child Labor Committee, which was then conducting a major campaign against the exploitation of American children. From 1908 to 1912, Hine took his camera across America to photograph children as young as three years old working for long hours, often under dangerous conditions, in factories, mines, and fields. Hine was an immensely talented photographer who viewed his young subjects with the eye of a humanitarian. In 1909, he published the first of many photo essays depicting working children at risk. In these photographs, the essence of wasted youth is apparent in the sorrowful and even angry faces of his subjects. Some of his images, such as the young girl in the mill glimpsing out the window, are among the most famous photographs ever taken. During World War I, he documented the plight of refugees for the American Red Cross. He later documented the construction of the Empire State building in 1930-1931 and even hung upside down from a crane to photograph workmen. As early as the 1830s, many U.S. states had enacted laws restricting or prohibiting the employment of young children in industrial settings. However, in rural communities where child labor on the farm was common, employment of children in mills and factories did not arouse much concern. Another problem for children was the popular opinion that gainful employment of children of the "lower orders" actually benefited poor families and the community at large. Entire families were hired, the men for heavy labor and the women and children for lighter work. Work days typically ran from dawn to sunset, with longer hours in winter, resulting in a 68-72 hour workweek. Many families also lived in company owned houses in company owned villages and were often paid with overpriced goods from the company store. Thus they lived a life entirely dominated by their employers. By the late 1800s, states and territories had passed over 1,600 laws regulating work conditions and limiting or forbidding child labor. In many cases the laws did not apply to immigrants, thus they were often exploited and wound up living in slums working long hours for little pay. Throughout America, local child labor laws were often ignored. On a national level, progress to protect children stalled as the U.S. Supreme Court ruled several times that child labor laws under question were unconstitutional. A subsequent attempt to pass an amendment to the U.S. Constitution failed. In 1904, the National Child Labor Committee was organized by socially concerned citizens and politicians, and was chartered by Congress in 1907. From 1908 to 1912, photographer Hine documented numerous gross violations of laws protecting young children. At many of the locations he visited, youngsters were quickly rushed out of his sight. He was also told youngsters in the mill or factory had just stopped by for a visit or were helping their mothers. 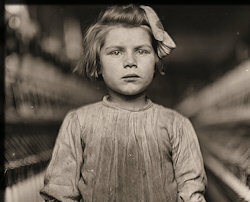 Attempts at child labor reform continued, aided by the widespread publicity from Hine's photographs. As a result, many states passed stricter laws banning the employment of underage children. In 1938, Congress passed the Fair Labor Standards Act, better known as the Federal Wage and Hour Law. The Act was declared constitutional in 1941 by the U.S. Supreme Court. The Act set a work week of 40 hours, with a minimum wage of 40 cents per hour. It prohibited child labor under age 16 while allowing minors 16 and over to work in non-hazardous occupations. The Act set 18 as the minimum age for work in industries classified as hazardous. No minimum age was set for non-hazardous agricultural employment after school hours and during vacations. Children aged 14 and 15 could be employed in non-manufacturing, non-mining, and non-hazardous occupations outside of school hours and during vacations for limited hours. According to recent global estimates by the International Labor Office, the number of working children aged 5 to 14 in developing countries is in the order of 250 million, of whom some 120 million work full time in various jobs often under hazardous conditions amid crude living conditions. A surplus of unskilled workers and low wages have combined to create conditions for children similar to the worst features of factories, mines and mills from the 1800s with minimal chances for education and future happiness.